Vo Trong Nghia Architects, winners of ArchDaily’s ‘House of the Year’ award, is undoubtedly Vietnam’s leading sustainable/green design firm. 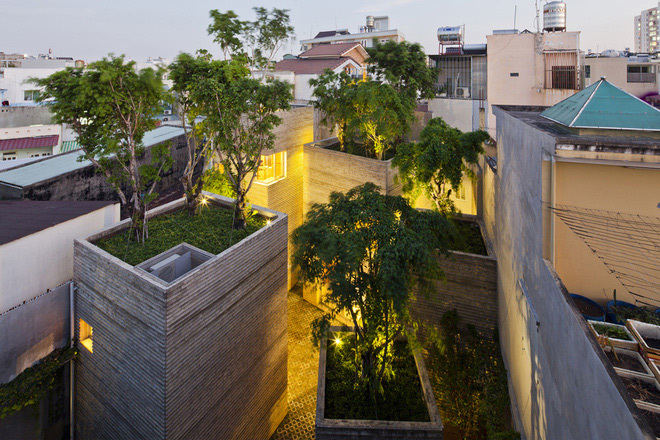 One of their latest projects, ‘House for Trees’ was completed earlier this year and offers a unique design, specifically tailored to Saigon’s climate. The ‘House for Trees’ project, located in Tan Binh District, features 5 separate concrete blocks, which take the idea of green roofing to the next level – think mini parks. Trading in the water barrels typically found on roofs in Saigon for trees and gardens, the design is an ingenious way to bring some green to the city’s park-starved outer districts. In addition to the green rooftops, the ground is built with permeable bricks which are meant to prevent flooding during the rainy season. The buildings might not be the most aesthetically pleasing we’ve ever seen, but this kind of architectural ingenuity is exactly what the city needs.